Designed to complement a player’s strengths, a tennis racket can increase performance when selected for its characteristics that highlight power, control and comfort. The best tennis rackets allow a natural forehand swing, with a loose relaxed arm. Industry experts analyze rackets for features and performance at variable levels of play and give exceptional ratings to rackets like Wilson, Babolat and Head. Used by players in the Women's Tennis Association, they also benefit beginners and intermediates looking improve their game. However, experts agree the best rackets are tailored to the individual. 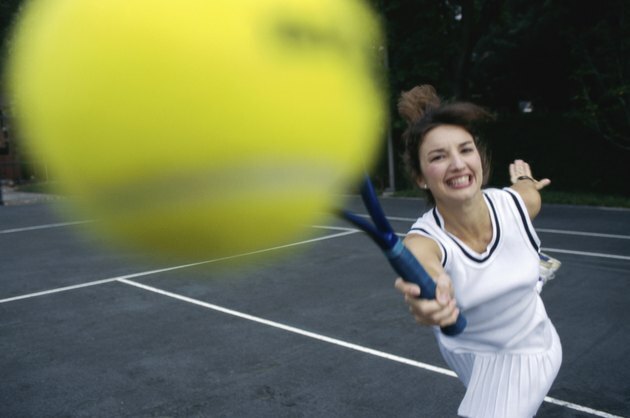 A racket with a larger head size has a greater sweet spot and is more forgiving on mishits than one with a smaller head. The International Tennis Federation says lightweight rackets with larger heads are easier to swing and better suited for beginners or intermediate players. Advanced players have an exceptionally powerful swing and generally select rackets that balance a smaller head with a little more weight to control heavy spin-loaded slices from the baseline or strike an attack from the net. Comfort is also a critical component -- rackets that filter vibrations to reduce stress on the arms will increase your level of enjoyment and reduce your chance of injury. A midsize racket, the Wilson Blade 104 is the weapon of choice for aggressive baseliners Venus and Serena Williams. Tennis Warehouse, an official partner of the WTA, tested the Blade and said it is impressed with its easy power, maneuverability and comfort. The Blade weighs 10.7 ounces and is 27.5 inches long, which allows maneuverability and greater reach for shots in all areas of the court. Beginners and intermediates will also benefit from its oversized 104-square-inch head, which ensures better contact with the ball and fewer mishits. The Blade combines Amplifeel and BLX technology. Unique to Wilson, Amplifeel hand technology improves overall feel and BLX embeds Basalt fibers, which is material made from natural volcanic rock, into the frame to reduce vibration and stress on the arm. Packed with spin and power, the Wilson Juice 100 BLX is a midweight racket at 11.3 ounces with a head sized at 100 square inches. Used by Women's Tennis Association topspin baseliner Victoria Azarenka, the Juice has a maneuverable frame with a generous sweet spot. Its moderate weight and light head are perfectly balanced to allow those powerful slices from the baseline. In addition, the Juice combines the Amplifeel and BLX technologies and filters out unwanted vibrations. Designed for aggressive, advanced players, the Juice is the "perfect choice for no-nonsense power baseliners," says Tennis.com. Balancing power and control, the Babolat Pure Drive is a versatile racket for any level of ability. It offers comfort and power for beginners and intermediate players, and for the advanced power players, exceptional spin and control. The Babolat blends power and precision and is a popular choice for WTA players like Julia Görges and Li Na. Its graphite and tungsten frame increases power while the Cortex Technology filters vibrations. This versatile, lightweight racket is 10.6 ounces, 27 inches in length and powers baseline topspins or slams at the net with its head that is 100 square inches. Experts at Tennishead magazine say Babolat "hit the nail on the head" with this racket. Head YOUTEK Graphene Instinct is a powerful racket that balances maneuverability, spin and precision. Used by aggressive baseliner Maria Sharapova, the Instinct features graphene, a light but strong composite that repositions weight from the shaft to the frame. Without increasing the weight of the racket, this increases power and stability. A solid, spin-friendly racket, the Instinct is 10.6 ounces, 27 inches in length and features a head size that is 100 square inches. In an overall review of the racket, an analyst at Tennis Warehouse writes: "I loved everything about this racquet. Everything about the racket works for my game." For beginners and intermediate players, the ultra-lightweight Head YOUTEK Three Star weighs 8.3 ounces and features an extended reach at 27.6 inches and a forgiving head size at 115 square inches that boasts a generous sweet spot.